Biggles at MeatHenge (links, right) has challenged the food community to submit a basic, weekday dinner dish that's easy, reliable, and something we actually eat two to three times a month. Oh, and by the way, his contest ended yesterday. So, as usual, I'm not playing by the rules. Except that my go-to meal is easy, reliable, and something I actually eat two to three times a month, if not more. But I know I have no chance with Biggles, because there's not a shred of meat or (worse, in his opinion) gravy in this dish. And it's so unsophisticated! I've been making it since my college roommate taught it to me. Leave it to BH&CC to goose it up, though. Enough jabber. 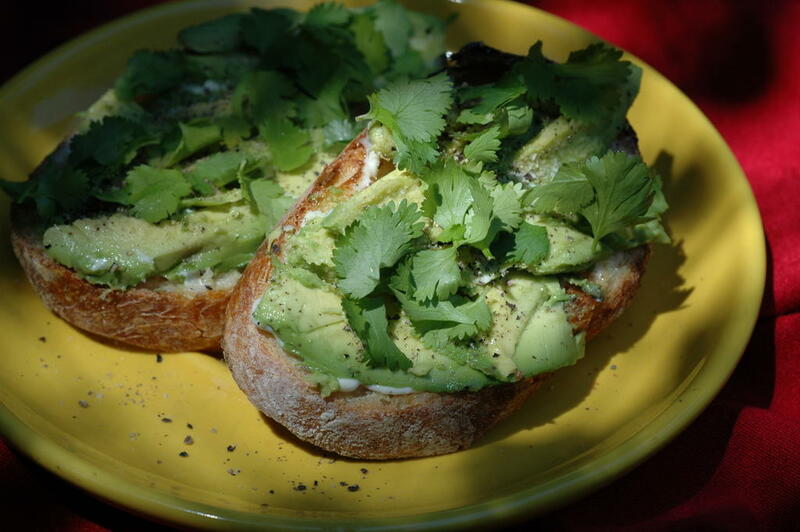 Feast your eyes (and maybe later your mouth) on the Open-Faced Avocado Sandwich. Toast up slices of good bread (we've been loving sourdough batard from Pan-o-Rama Bakery in the Mission, S.F. ; find it at the farmers' market or some Bay Area Whole Foods). Spread with mayonnaise. Layer slices of ripe avocado over that. Sprinkle with nice salt (Diamond kosher will do fine), cracked black pepper and a very judicious amount of plain ol' garlic powder from those tall plastic jars from the drugstore. Crown with BH&CC's, erm, crowning touch: fresh cilantro leaves. It's convenient and fail-safe, because the bread needn't be sparkling fresh (toasting old bread is such a resuscitator), avocados seem to last for weeks in the fridge, and (at least at my house) there's always a bunch of cilantro, root-end down in a glass of water and tops loosely draped with a plastic bag, in the fridge too. But I'm at home this moment and don't have my login stuff for my web site handy. We're getting there. Hey, it's Lisa B-K and I have a blog here now. Tomatoes posted (and tomorrow, pasted) just for you. LBK: You succumbed to the allure! I'll go have a lookie. Oh, I do so love avocado.... this is delish! Yeah, what am I going to do about avocados during August? Anybody got an idea? avocados must grow around here somewhere?